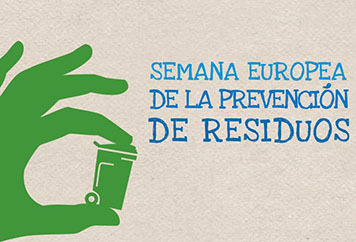 Humana joins again the European Week of Waste Prevention, organizing diverse activities with which it wants to emphasize the importance of a correct management of the textile used. 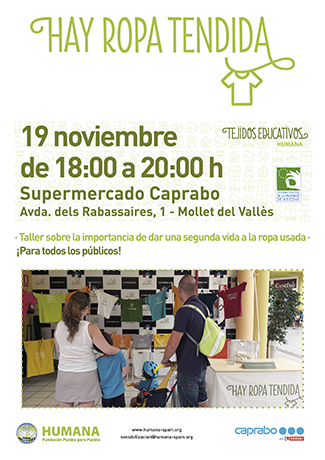 In the case of Catalonia, the Foundation has a tight sensitization agenda, with several workshops and activities dedicated to the importance of textile reuse. The Foundation launches on the occasion of the EWWR the third edition of the campaign #pasaturopa to promote the reuse of textile. 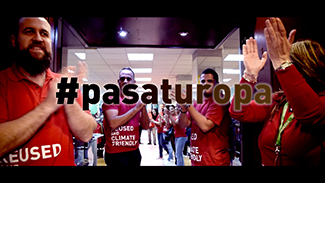 The #pasaturopa campaign is supported by a video featuring a large part of the Humana textile classification plant in Granada and the Fundación's stores in Granada, at www.pasaturopa.org and at Dissemination in social networks and media. The purpose is to achieve the maximum possible impact and, with it, to promote a greater awareness on the positive impact on the environment that has the reutilization of textile. In addition, on the occasion of the EWWR will be carried out small actions driven from various departments of the Foundation. For example, in Asturias neustro team is committed to permanently remove plastic cups from a single use of the water and coffee machine. There will be only glasses for the visits and these, after their use, will be deposited in a bucket for containers with a yellow bag, and then deposited in a yellow container. It is estimated that a person buys about 16 kg of clothing annually and that a significant percentage is rarely used ... until the end of its useful life in the garbage or in a container of textile waste, in the best case. Of the total of garments that each year the Spanish discard, only one in five is deposited in a container of textile waste or delivered to an organization specialized in reuse. A very high percentage of the clothes that no longer serve us can be used again, thus reducing the volume of waste. Because, if the clothes are already produced, why destroy it and produce it again? The reuse and recycling favor the saving of natural and energy resources that would be destined to the production of new garments. It is estimated that producing one kilo of cotton represents 6,000 liters of water, the emission of 3.6 kg of CO2 and the use of 0.6 kg of fertilizers and 0.3 kg of pesticides. The clothes that are collected annually in each container of Humana, to go to a landfill and therefore to be incinerated, would produce 10 tons of CO2.